WE cannot make a picture of God to ourselves. We have no way of representing to ourselves by images or sensible figures, eternity or omnipotence. We should fall into grievous error if we even attempted to put God before ourselves in this way. Yet it is of great consequence to our spiritual life that we should have a clear idea of God; for it belongs only to the higher stages of mystical union with God to contemplate Him in obscurity, to enter into clouds and darkness, and be able to find our rest and satisfaction there. Now we can bring God before ourselves with sufficient clearness by denying of Him every conceivable imperfection, or again by affirming of Him in the most superlative way every conceivable perfection. But those who have been long accustomed to meditation, and have thus become familiarized with the works and mysteries of God, may obtain their idea of God in a different manner. When we form to ourselves as perfect a picture of God as we are able, and then take it to pieces again to see how it is composed, we find it made up of nine mysteries, -----four in God Himself, and five outside Himself. The four in Himself are Innascibility, 1 Generation, Procession and Unity, by which we express the doctrine of "Three Persons, One God." The five mysteries outside Himself are Creation, Incarnation, Justification, Glorification, and Transubstantiation. You must not misunderstand me to mean that this picture forms an adequate representation of God, or one which is perfect in any other sense than relatively to ourselves. There are nameless attributes in the Most High, depths of perfection for which creatures have no name because they have no ideas of them. There are in Him summits of beauty and glory, whose shadows, if they cast any, would fall far beyond this present world of ours, or indeed any finite creation. There is nothing in God which is so simply a cause of delighted love and abounding joy as that He is incomprehensible, and beautiful, and glorious beyond the reach even of angelic conception. But the picture of God I am speaking of is perfect in that it embraces all we know of Him, all He has told us of Himself, all we require for an intelligent love and profound adoration of Him, while it includes also in itself a history of God's works full to overflowing of motives for the most intense reverence and the most tender love. We are not concerned now with the first four mysteries, those inside God Himself, which express the doctrine of the Most Holy and Undivided Trinity. We have to do with the works which the Holy Trinity has vouchsafed to work outside Himself; and of these five crowning works, Creation, Incarnation, Justification, Glorification, and Transubstantiation, Transubstantiation is the greatest and most perfect, as expressing most fully the interior perfections of God Himself. This is what I set myself to show in the present book; and you must be indulgent to me if I am hard and dry in the discussion, because I have many things to say hereafter which might seem mere poetry or devotional exaggeration instead of grave and sober truth, unless I have persuaded you to follow me through this investigation of the works of God. When men speak of one of God's works being greater than another, it is not that they pretend to sit in judgment upon God, or arrogate to themselves such a comprehension of His designs as will fit them to make a critical comparison of His works. Nay, in all God's works they acknowledge that there may be, and probably are, ends and purposes of wisdom, justice, and mercy, which are beyond their sight, and are even unsuspected by them. But they speak with all reverence in a human way, to the best of their judgment, as it strikes them, and as the Church and her doctors lead them to infer. The saints are the works of God; yet as the Apostle tells us, one star differs from another star in glory; and Scripture teaches us that God has given up the world to the discussion of the sons of men. In this spirit we may venture to compare the gracious works of God one with another, confessing the least of them to be deeper than we can fathom, higher than we can measure, broader than we can embrace, and more full of condescension than all the merits of angels and men could ever have a right to claim. All human hearts which aim at the discovery and expression of the beautiful, whether by form, by colour, by sound, by language, or in any other way, have certain canons of their own by which they are guided in their search and determined in their judgments. In God's works He is His Own rule; for He is all beauty, all skill, all wisdom, and all goodness. But from the knowledge He has been pleased to give us of Himself, we may venture to draw certain canons or criteria by which we may the better discover the divine beauty of His works for our own instruction, and to gain fresh matter for prayer and adoring love. We may thus ask the question, wherein consists the perfection of the eternal operations of God? I answer, that in our manner of speaking and according to our understanding, it consists chiefly in five things; and a work of God is more beautiful, more wonderful, more gracious, in proportion as it unites in itself the greatest number of these five things in the greatest degree. First of all, the perfection of the Divine Works consists in the lowest depths of condescension which they reach. All God's works are condescensions. He made Himself infinitely little, says St. Ephrem, in order to make the world which seems to us so great. He had no need of us, nor of any possible created beings, however wise and holy and beautiful. Creation is not necessary either to His glory or His happiness, nor strictly speaking to His goodness. None of God's outward works are necessary. Thus creation was a marvellous act of condescension. But if the Eternal Word had taken upon Himself the nature of an Angel, and assumed it to His Divine Person, it would have been a more perfect work than creation, because the Divine condescension would have gone further out and reached lower down. For the Eternal Word to take the lower nature of man upon Him, the lowest of reasonable natures, is a more perfect work than the assumption of angelic nature would have been, for the very reason that it is a lower depth of loving condescension. Had man never fallen, and had our Lord vouchsafed to assume the impassible nature of sinless humanity, in order to dwell with us and be as it were one of us, it would have been a work of such perfect love that neither Angels nor men could have imagined it without revelation. What then are we to say when He has taken upon Him our passible nature, and has actually suffered, and exhausted all manner of suffering, mental and corporal, in it, not only in spite of our sins but in order to redeem us from our sins, and make us kings and co-heirs with Him in Heaven? This is a more perfect work because of the still lower abyss which is reached and occupied by the Divine condescension. It seems then of the very nature of God's works, because they are works and because they are His works, that the degree of condescension which they imply is in truth the measure of their perfection. The more love they hold, the more perfect they are; and the lower God deigns to stoop, the more loving is His condescension. A second criterion for determining the perfection of the Divine works, is to be found in the greatest heights to which they raise the creature. Every condescension of the Creator implies the elevation of the creature towards Himself. This is their very object. Creation itself is for this end. The Church, grace, Sacraments, good inspirations, God's evidences of Himself, all mean this, the approach of the creature to the Creator. Thus to redeem mankind from their sins through the Precious Blood of Jesus Christ, and to allow them to live a life of immortal happiness on this beautified earth, after the day of judgment, with every joy short of the Vision of the Most Holy Trinity, would have been a great work of love, because it would have raised men out of sin into holiness, and out of God's enmity into His friendship. How much more perfect a work is it to be raised to see God face to face, and as He is, and to be conformed to the likeness of the glorified Body of our dearest Lord! The Law was a beautiful work of God's compassion; yet it is so overshadowed now by the more perfect beauty of the Gospel that we can hardly appreciate its real beauty; yet as the characteristic of the Jewish Law, as compared with the loose fragments of natural religion and primitive revelation in the systems of paganism, was that men had God near to them as no other people had, so in the Gospel it is the very nearness of God to us and the closeness of our union with Him, which gives its surpassing beauty to the Christian Church. So in ascetical theology we count the degrees of perfection in mortification as they raise us nearer to God; and in mystical theology we distinguish the successive states of mental prayer and heights of contemplation according to the intimacy and completeness of our union with God in each of them. Grace is greater than nature because it lifts us nearer God, and glory puts grace beneath it because it effects a closer union between the soul and God. Thus the greater the height to which any work of God raises the creature, the greater is its beauty and its perfection. The purely spiritual character of God's works is another standard of their perfection. This is only saying in other words that spirit is more glorious than matter, and the soul more wonderful than the body. The spiritual regeneration of the world is a more beautiful work than the first material creation, though the one could not have been without the other. To work a miracle by a word seems more perfect than to use the instrumentality of matter, though this last may often be more expedient, and give God greater glory. But matter and spirit are God's creatures, and He can use either of them separately or both together when He vouchsafes to work, yet the more spiritual the manner of His operation the more perfect do we usually account it. It is this very thing which gives such a peculiar dignity and loveliness to the operations of grace in the souls of men. Thus, supposing two Divine works in our eyes of equal magnitude and with objects of equal importance, we should give the preference to the one which was wrought in a more purely spiritual manner, as representing to us in a higher degree the character of the Almighty. Thus the low and mistaken notions which they had of Messiah's kingdom and sovereignty, seem to have been the main reasons of the Jews remaining unconverted. The failing to perceive the spiritual character of the Gospel drew down our Lord's reproof upon James and John. Gross views of the resurrection of the body called forth the indignation of St. Paul, and a want of spiritual discernment caused some to fall away from our Lord at Capharnaum when He first revealed the doctrine of the Holy Eucharist. God's honour is especially implicated in the spiritual operation of His works, and in the discernment of it by His creatures. We may therefore rank the presence of this peculiar method, as a criterion of the perfection of His works, at least when it is found in conjunction with others. A fourth criterion of the perfection of the Divine Works is to be found in the union of continuity and multiplicity which distinguishes them. Their continuity represents the immutability of God, and their multiplicity His magnificence and liberality. Thus to be confirmed in grace, as the Apostles were, is a higher state than ours, because it is continuous. Transient effects are less perfect than those which are permanent. Half an hour's ecstasy on earth, even if it involved the intuitive sight of God, is a less work than the abiding rapture of the Beatific Vision in Heaven. The notion which some of the heathen had of God without providence, who having created the world left it to itself, is, putting aside its impiety, a less perfect idea than that which represents Him as the perpetual life of the world, supporting, sustaining, and invigorating everything; and it is so because of its want of continuity. The mystery of creation would lose half its beauty, if preservation were not included in it. Multiplicity is also an especially divine characteristic. Thus to be forgiven our sins once in Baptism is a beautiful and perfect work; but when forgiveness is repeated, renewed and multiplied, time after time, in the perpetual Sacrament of Penance, how much more perfect and beautiful is the work of forgiveness! The glory of the Church is that the narrowness of the Synagogue has been done away, that believers are multiplied, and grace multiplied also upon each one of them. What was the creation of all this universe of worlds compared with the shedding of one drop of the Blood of Jesus? But the dust of Olivet and the stones of Jerusalem, the folds of His garments, the lashes of the scourges and the thorns of His crown, the iron of the nails, the head of the spear and the wood of the Cross, all steeped with the Precious Blood of God, what revelations they are of the exuberance and prodigality of the Divine Love! Thus where we find continuity and multiplicity combined in any of God's works, it is to us a fresh mark of beauty and perfection. Lastly, the works of God have a greater or a less perfection according as they represent and shadow forth the greatest number of the Divine Perfections. All God's works are disclosures of Himself, and as to know God is eternal life, the more complete the revelation of Him, which any work may be, the more obviously is it a proof of its perfection. Thus Hell, considered simply as part of creation, is a very beautiful work. It shadows forth the unutterable purity of the Most High. It speaks most eloquent things of the splendour of His justice. Nay, silver lines of mercy are thrown across the dark abyss, in that even there sin is not altogether punished as it deserves to be, and also because its vindictive fires are preaching daily to the world and thus defrauding themselves of millions of souls who would otherwise have been their prey. Hell is terribly beautiful. Yet Purgatory is still more beautiful; for it is eloquent of God's justice, His justice even on forgiven sin and on souls whom He dearly loves. It is a more complete revelation of the Divine Purity than Hell, in exhibiting to us the Beatific Vision long delayed as the consequence of absolved and venial sin. Then in addition to all this, it is a revelation of love, such as hell cannot be. It is a display of the ingenious artifices of heavenly compassion to multiply the number of the saved, and to hinder their cowardice and coldness from being their utter ruin. Thus it tells us a great deal more about God than Hell does, revealing ways and characteristics of our Heavenly Father, which no contemplation of Hell, however lengthened, ever could have revealed; and thus, in this point of view, it is a more perfect and beautiful work than Hell. But if we compare heaven with Purgatory in this same respect, it is evident that Heaven is a much more beautiful and perfect work, simply as revealing so much more of God, and independently of other considerations which will be obvious to every one. 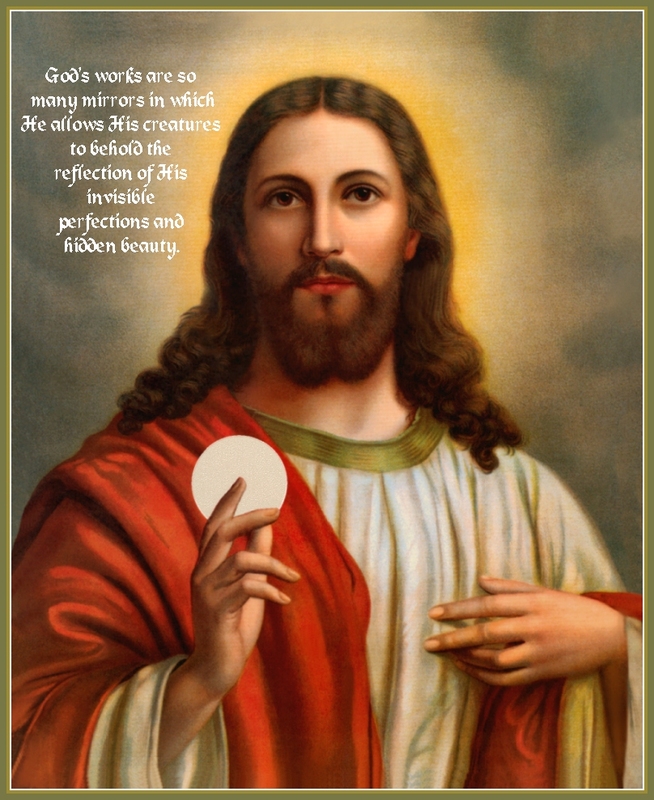 In fact God's works are so many mirrors in which He allows His creatures to behold the reflection of His invisible perfections and hidden beauty; and just in proportion as the reflection is the more extensive or more minutely clear, so is the perfection of the mirror in which we behold them. And thus one way of determining the perfection of a Divine work is to see how many of the Divine Perfections it shadows forth, and with what degree of clearness and precision. These then are the five criteria by which we may dare to judge of God's works, the canons we may call them, of artistical beauty in the Divine operations. We find the beauty of God in His works in the lowest depths of condescension which they reach, in the greatest heights to which they raise the creature, in the purely spiritual character of their operation, in their continuity and multiplicity, and in their shadowing forth the greatest number of the Divine Perfections. 1. The Person of the Father cannot be known by the fact that He is from another; but by the fact that He is from no one; and thus the notion that belongs to Him is called "innascibility." --------Web Master: because most unabridged dictionaries do not include this term, most people have no way of looking it up. The definition is from St. Thomas Aquinas in his Summa.